Android Devices major advantages over Android Devices is that Android design Devices are greatly User Friendly. User Interface that directly affects the UX. UI is all about individuals and their interaction with the app. Smart Android UI/UX development services can work wonders for an app as it is one in all the first elements that a user notices and focuses on. Our designers utilize the complete potential of skillfulness and functionality of android platform so as to develop out-of-the-box designs. We design operating android UX/UI is matching to rich android standards. Android design is therefore customizable & flexible that provides a high quantity of practicality and flexibility which it offers to developers and designers. Android UI/UX Developer is most interactive, entertaining & simple that designers love due to skillfulness and are ready to tweak the designs to the most extent possible and provides your app is UI a unique flare. This successively will create an effect on the User expertise, thereby facilitating not only revenue generation from the app but additionally whole growth and recognition. At Axis Technolabs, We are always responsive to the shifting trends in UI/UX preferences and the manner associate android user thinks. In addition, Our Android UI/UX Designer has a unique understanding of app designs carrying business growth in mind. Axis Technolabs carries out a rigorous selection method to confirm that we choose only the best android UX/UI development company in India and brightest UI/UX designer for the development of app UI, who have the understanding of UI/UX design & android design. Hire Android UI/UX designers and developers are creative and intuitive, which suggests that your apps UI/UX will not only look unique and rich, however will also increase User experience expanding. 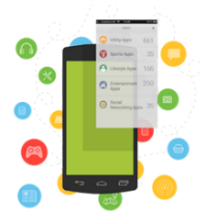 Android SDK Implementations for better app development.